From Corregidor to Wardak...the legacy continues. After 11 years of sustained conflict in Afghanistan, the "Sky Soldiers" of 2d Battalion (Airborne), 503rd Infantry Regiment continue to contribute and sacrifice towards the Global War on Terror. In the Spring of 2012, the 173rd Airborne Brigade Combat Team received orders to deploy for the fourth time in support of Operation Enduring Freedom (OEF). This deployment would be known as OEF XIII. During this deployment, Task Force ROCK was tasked with securing over 80 kilometers of Highway 1, which is the life line to the capital city Kabul, and increasing the capacity of the Afghan National Security Forces in the province of Wardak, Afghanistan. From July 2012 to March 2013 the Taliban based enemy resisted Task Force ROCK's accomplishments at every turn. 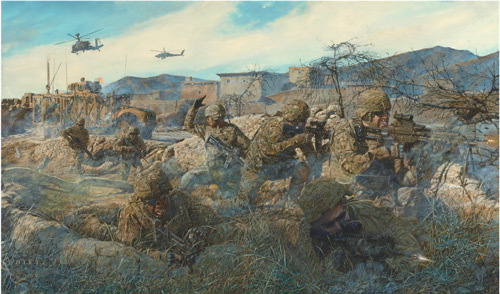 The battalion used a balanced approach of aiding their Afghan brothers to improve their warfighting skills and lethally removing enemy from the area of operations. With this method Task Force ROCK successfully contributed another chapter to the unit's storied heritage. The history and lineage of Task Force ROCK is steeped with acts of determination and brilliant feats of valor. The battalion traces its name from the airborne assault that took place on 16 February 1945 when the battalion jumped on Fortress Corregidor to liberate that island from occupying Japanese forces. The airborne assault on Corregidor, also known as "The Rock" for its volcanic origins, was intense and the heaviest for the battalion in World War II. Braving intense fire, the Paratroopers rushed forward and overcame the heavy blockhouse defenses, dropping explosives into fortifications to reduce hidden Japanese gunners. For its successful capture of Corregidor, the unit was awarded its first Presidential Unit Citation and also received its well earned nickname, "The ROCK!" Consequently, the actions of Task Force ROCK Paratroopers in OEF XIII were reminiscent of those in this scene. The fearless individual Paratroopers moving in disciplined formations to engage the imminent threat were common place during OEF XIII. These types of courageous actions were frequent as the Task Force increased the capacity of three Afghan Army Battalions and Police while simultaneously fighting to secure the highway. Dismounted Paratroopers maneuvering through the hinterland with aerial weapon teams and tactical vehicles in support were the norm as The ROCK controlled Highway 1. The enemy was savvy and used lethal tools like improvised explosive devices, rocket propelled grenades, and small arms fire to thwart the Task Force's efforts; yet their actions were futile. The ROCK Paratroopers endeavors were selfless and at times truly valorous; moreover they were notably following in the path of the battalion's forefathers and continuing the legacy...the proud legacy of The ROCK! We offer fine custom wood framing using the latest conservation materials and techniques. Each print comes with double acid free matting and mounting. We only use UV Filtered Glass to protect your print. All work is done on the premises by the owner. Special attention is paid to the packing to ensure your framed artwork arrives safely ready to hang in your home or office.